Our sale catalogs have been mailed, and videos of the sale lots are now live on our website. We also have a digital copy of the catalog available on our website. 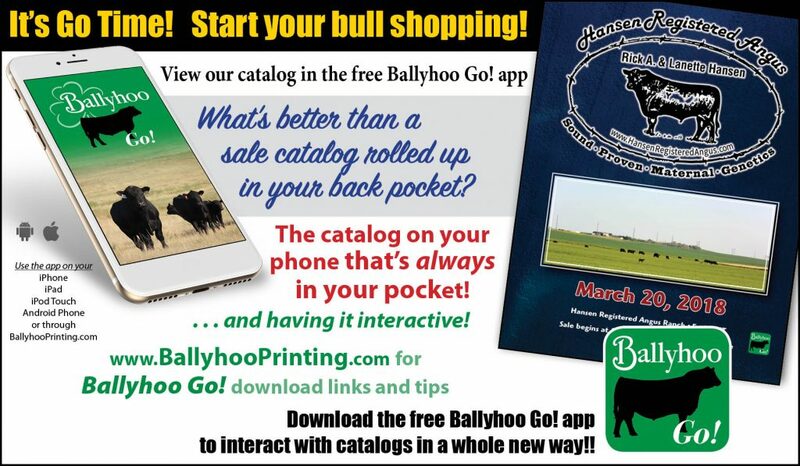 For those of you who use mobile devices, our sale catalog and information can be viewed on the Ballyhoo Go! App. We hope to see you at our Opening Day at the ranch (13 1/2 miles East and 2 miles North of Froid, MT) on March 20th. Lunch will be served at noon, and sale lots will be auctioned starting at 1:30. If you are unable to be here sale day, you may leave your bids with us and we will use them as you would. Any lots not sold during the auction will be available by private treaty on a first-come, first-serve basis beginning March 27th. If you can’t make it to the Opening Day, or if you would like to see the bulls before March 20th, give us a call and come by the ranch. We look forward to seeing you and showing you the sale lots. If you have any questions about the sale lots or our breeding program, please don’t hesitate to give us a call.